In order to take online donations, you need to first set up online payments. If you can take online donations, you can also process other electronic donation payments. Even if you don't take online donations, you can still record donations that arrive by other means. You get the donation page link in front of donors—say, via an email campaign or by embedding the donation form in another web page. As donors visit the page and submit donations, they'll appear on the Donations report (and recurring donations will be viewable on the Recurring report). You'll then link the donation to the donor—whether by linking to an existing person in Populi or by creating a new person using the donation info. You may also wish to link certain donations to donors via a soft credit—say, the spouse of a donor, or a member of a donor organization who helped arrange the donation. 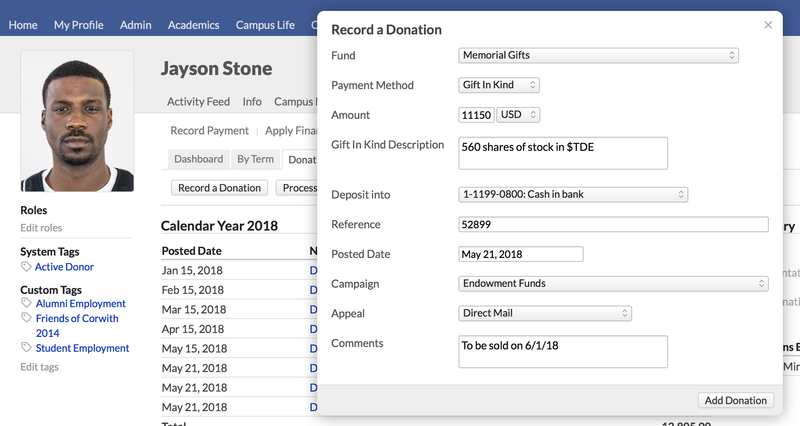 On a person or organization's Profile > Financial > Donations view, you can record and process donations. You'll record a donation when you receive it "offline", as it were: someone mails you a donation check, or hands you a duffel full of 50-dollar bills, or sends you a money order, etc. In other words, you're recording the donation separately from the actual financial transaction. You'll process a donation payment when someone wishes to donate electronically and in-person: someone calls you up with a credit card number or comes into your office with a routing number for his checking account. Processing a donation both records the donation and creates the actual financial transaction. 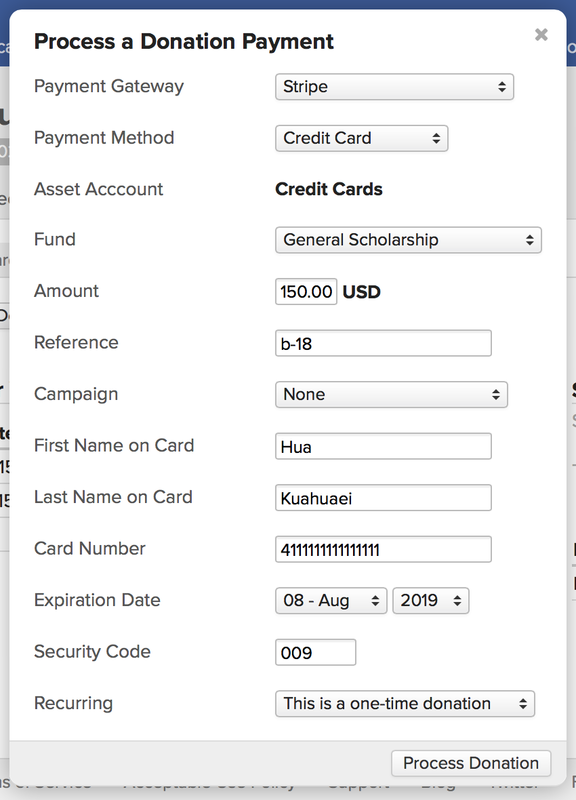 Here's how to record a donation that you are not directly processing through Populi. Select a fund from the drop-down, or choose to split between multiple funds. Select a payment method and enter the amount. Select an asset account into which to deposit the funds, and enter an appropriate reference. If necessary, modify the posted date. If this donation is connected with a campaign and/or appeal, select those from the drop-downs. Here's how to record a gift-in-kind donation. In the Record a Donation dialog, select Gift in kind as the payment method. You can enter an amount or leave the amount at $0.00. Enter a description of the gift. This field is required! In the U.S., the IRS does not require schools to record an amount—that is up to the donor when he files his taxes. In Canada, the CRA requires schools to declare an amount that the gift is worth. Wherever you are, make yourself familiar with the appropriate regulations for gifts-in-kind! Otherwise, record the donation as you would any other donation. Gift-in-kind donations display on the Donations report with the symbol next to the amount. Click Process a Donation Payment. Select a payment gateway from the drop-down. Select a payment method; your options here depend on what's been set up in Financial > Settings > Payment Gateways. Depending on your selection here, the asset account field will automatically update. Select the fund to which this donation will be applied. Enter the amount and an optional reference number. Enter the payment information (name, account numbers, etc.). If this is a recurring donation, make the appropriate selections. After the donation has been recorded, the donor receives the Active Donor tag (which corresponds to the donor status of the same name). You'll also want to follow up with the donor by acknowledging the donation and sending him a donation receipt.